Does it ever bother you that the Bible seems to get such bad PR in the mainstream media? Yeah, me too. But that’s why I’m interested in a new TV show that’s recruited the Bible as its star. 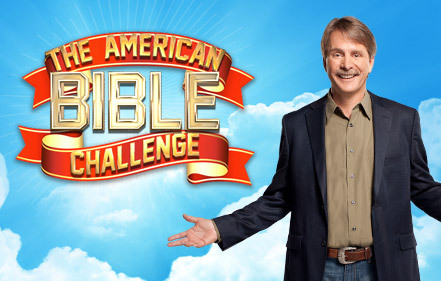 The show is called The American Bible Challenge (premiering August 23 on the Game Show Network) and it’s hosted by comedian, author and television personality, Jeff Foxworthy. He also hosts another game show on the Fox Network, Are You Smarter than a 5th Grader? The show has the backing of two ministries that Scripture Union has partnered with over the years: The Salvation Army is the main sponsor, and the American Bible Society is the behind-the-scenes Bible study engine. The producers of The American Bible Challenge claim it’s a game show that’s been “3,400 years in the making.” Whoa. That’s a lot of market research. I just hope it’s a big hit because in addition to getting some good PR for the Bible, it’ll expose more people to the life-changing message of God’s Word. I am looking forward to returning to FL to see if our programming includes this offering. We have been without TV since May 2012 as we travel to visit friends and relations. Wonder why it is called the “American” Bible Challenge. I certainly hope we are well versed!